Ken, from the WHT Walkie-Talkies walking/running team flashes a shaka just before awards ceremony where they took top honors for completing the most miles of all the teams involved. Curses! We came in second place, this is the third year I’ve been on the 2nd place team, with our team the WHT 6rs. You can see more photos of the teams at the Friends For Fitness website. 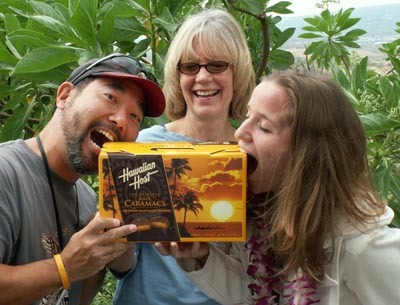 Priscilla and I can’t wait to dig into the Maui Caramacs as we accept our prizes with Lana. Not bad. The West Hawaii Today teams took 1st, 2nd, 3rd and 7th places overall. Which means we get to put on the feedbag! The bossman said if all four teams place in the top 8 places he would treat us to lunch. 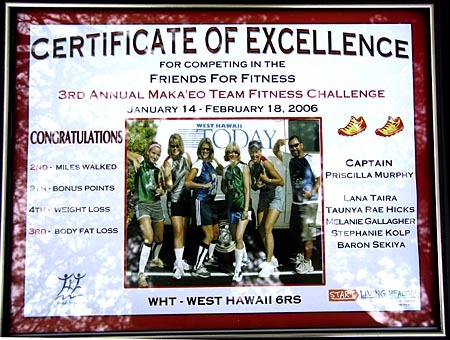 Here’s our certificate. We took 3rd place for body fat loss which isn’t bad at all. Our team did 855.2 miles during the competition.